The New York Times published two stories on the front page of its Oct. 30 print edition that blame President Donald Trump and his allies for the massacre at the Tree of Life synagogue in Pittsburgh. Both stories are positioned prominently above the fold on the newspaper’s front page. The first article, as examined by The Epoch Times in a previous analysis, cites no evidence while painting Trump as a peddler of anti-Semitic conspiracy theories and suggesting that his presidency is linked to a rise in anti-Semitism. The second article, titled “Caravan Rhetoric Intersects With Deadly Hatred,” runs across three columns and suggests, again without evidence, that Trump’s comments about the migrant caravan in Mexico caused the synagogue massacre. “There is clear overlap between the hatred and delusion that drove this lethal behavior and the paranoia and misinformation surrounding the caravan,” the writer, Jeremy Peters, asserts in summarizing the story. The New York Times offers no evidence for why the comments about Soros have “a strong whiff of anti-Semitism.” Trump has never publicly suggested that Soros is financing the caravan. One of Trump’s allies, Rep. Matt Gaetz (R-Fla.) wondered on Twitter whether Soros, one of the biggest advocates for open borders, could be one of the financial backers and called for an investigation. The message by Gaetz included a video of caravan migrants receiving cash. Trump later shared the same video but made no mention of Soros–unless you believe The New York Times, which reports, despite linking to a tweet that contradicts its claim, that “Trump tweeted a video on Oct. 18 that purported to be of someone connected to Mr. Soros handing out cash to the migrants.” Neither the video nor Trump’s tweet makes any mention of Soros. The New York Times incorrectly suggests, by positioning its false reporting about Trump’s Twitter message and the mail bomb attacks in the same paragraph, that Trump’s message provoked Sayoc. The only time Trump did mention Soros on Twitter was Oct. 5, during the heated days of the confirmation hearings for Justice Brett Kavanaugh. The president said that “Soros and others” paid the women who cornered Sen. Jeff Flake (R-Ariz.) in an elevator and screamed at him about his support for Kavanaugh. Trump’s assertion is factually sound. One of the women, Ana Maria Archila, is the executive director of the Center for Popular Democracy, a group heavily funded by Soros through his Open Society Foundation. The other woman is an activist for the group. The center’s front page even featured a photo of the elevator scene on Oct. 5. The article goes on to suggest that the views of the president and Republicans are rooted in “unfounded claims about the caravan’s origins and wildly fluctuating estimates of its size” made by “right-wing commentators, conspiracy theorists, and activist groups.” Contrary to that claim, Trump’s statements have been based on official sources. The president’s assertion that the caravan includes gang members is based on a report by the U.S. Department of Homeland Security. As for the “wildly fluctuating estimates” of the caravan’s size, the newspaper is omitting the fact that the estimates vary in size based on numbers from official sources, including Mexico’s interior ministry and the caravan’s organizers. 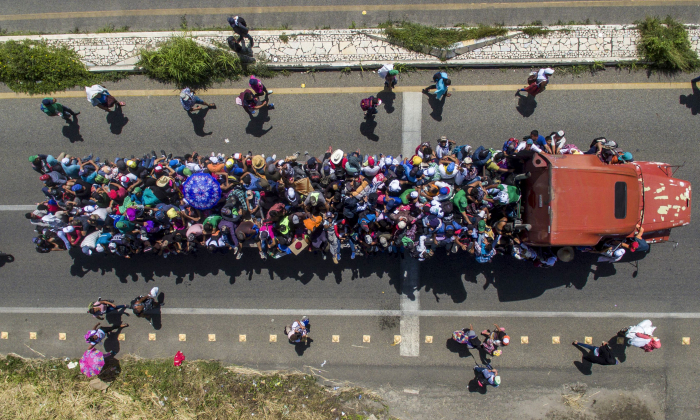 Vice President Pence cited official intelligence and conversations with top foreign officials to report to the public that the caravan is funded by leftist groups. By omitting the relevant facts, the newspaper is either not aware that the news originated from Pence or considers the vice president a conspiracy theorist. The article is the latest in a narrative spun by The New York Times that Trump is an anti-Semite. The newspaper omits from its latest report that Trump’s daughter, Ivanka Trump, married a conservative Jew and converted to Judaism. Trump also ended a trend of broken promises by prior presidents and moved the U.S. Embassy in Israel to Jerusalem, earning widespread praise. “The people of our Great Country are angry and disillusioned at receiving so much Fake News. They get it, and fully understand!” Trump added.